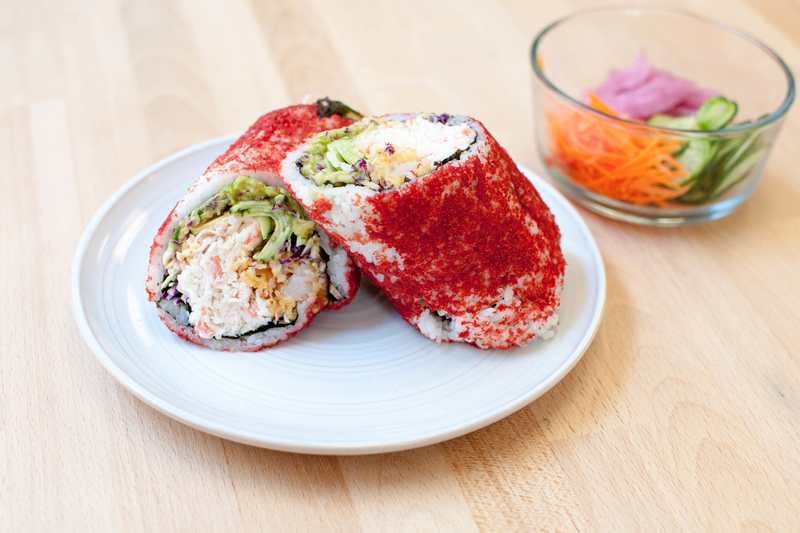 New York is filled with top-notch Japanese food and colorful, edible trends—and both are combined in the sushi burrito. 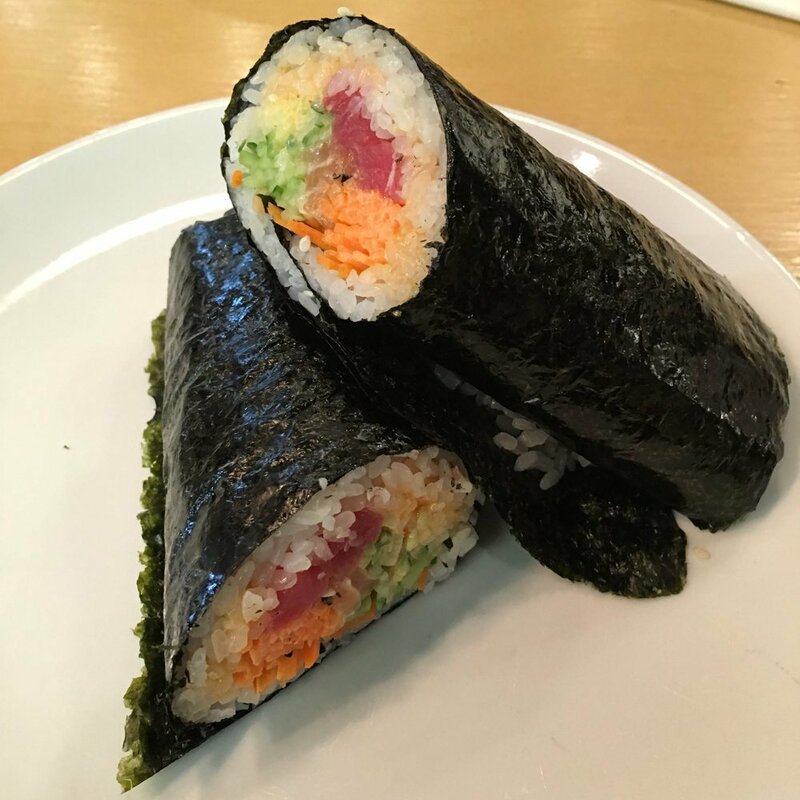 NYC has no shortage of regular sushi on just about every street corner and there’s plenty of the best ramen in town, but newcomer hybrid bites like the sushi burrito can be a bit more difficult to track down (it isn't at all-you-can-eat sushi restaurants yet, unfortunately). Trust us, you don’t want to miss out on these extra large, handheld maki rolls jam-packed with an assortment of sushi delights like fresh yellowfin tuna, creamy avocado, spicy jalapeño, crunchy daikon and pickled ginger. 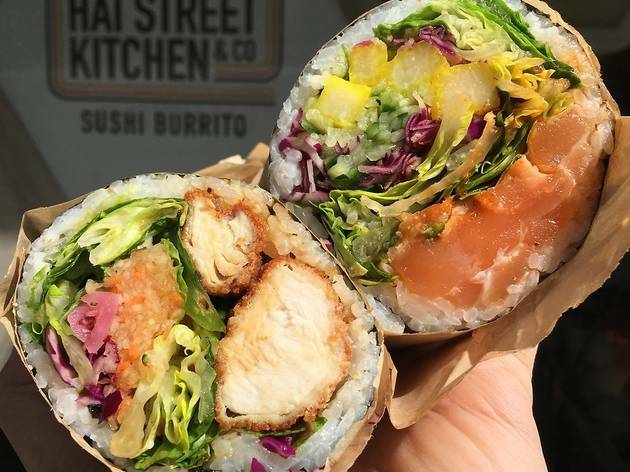 That’s why we’ve rounded up all the places you can get a sushi burrito in NYC, so the next time you’re craving an on-the-go oversize meal, you’ll know exactly where to turn. 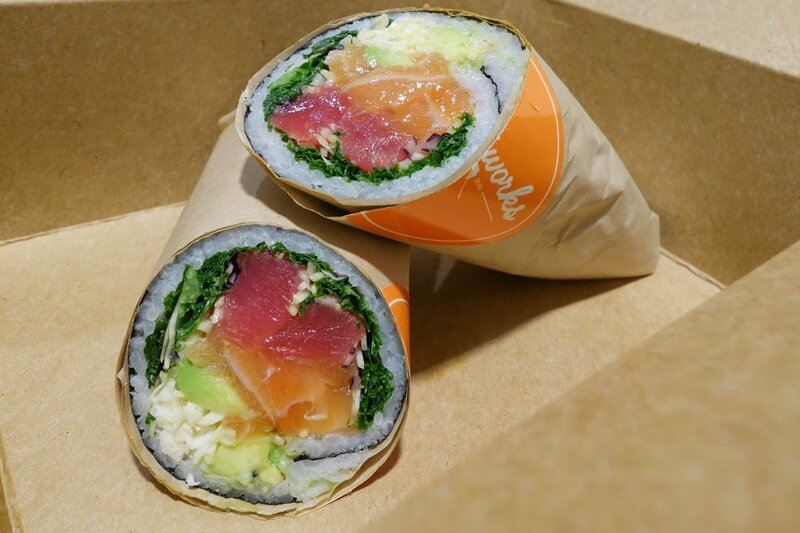 Photograph: Courtesy Yelp/ Mike C.
More than a year since its inception, NYC’s inaugural sushi burrito still reigns supreme. 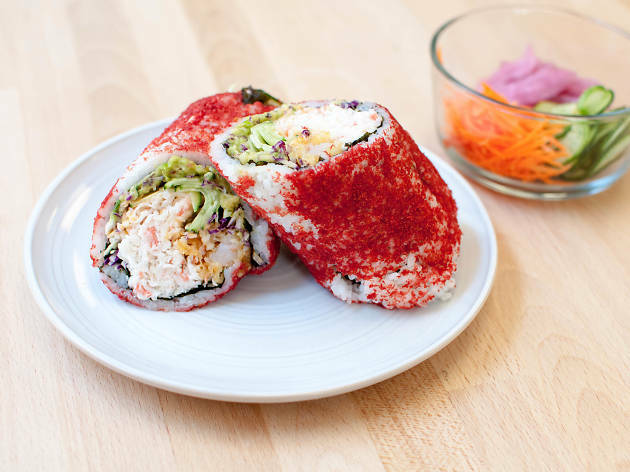 And its supremacy comes care of chef Chris Jaeckle (All’onda) who, inspired by Brazil’s fast-casual sushi eateries, encourages New Yorkers to customize their uma-rittos with a colorful assortment of fresh fish, rice, veggies and sauces—including a zippy wasabi ginger and a cooling avocado lime. 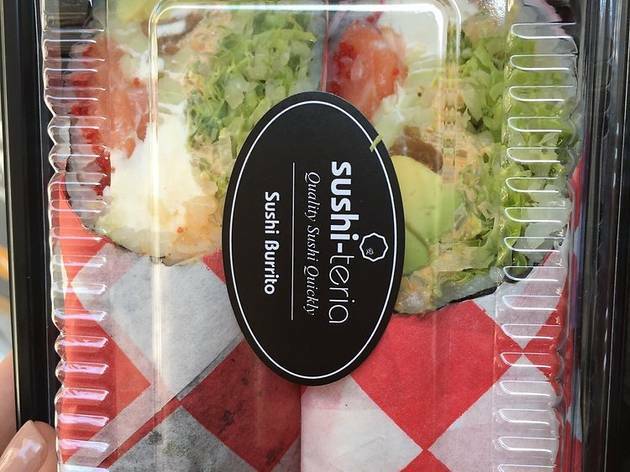 The very first sushi burrito joint originated in San Francisco, but it finally arrived in NYC in October. 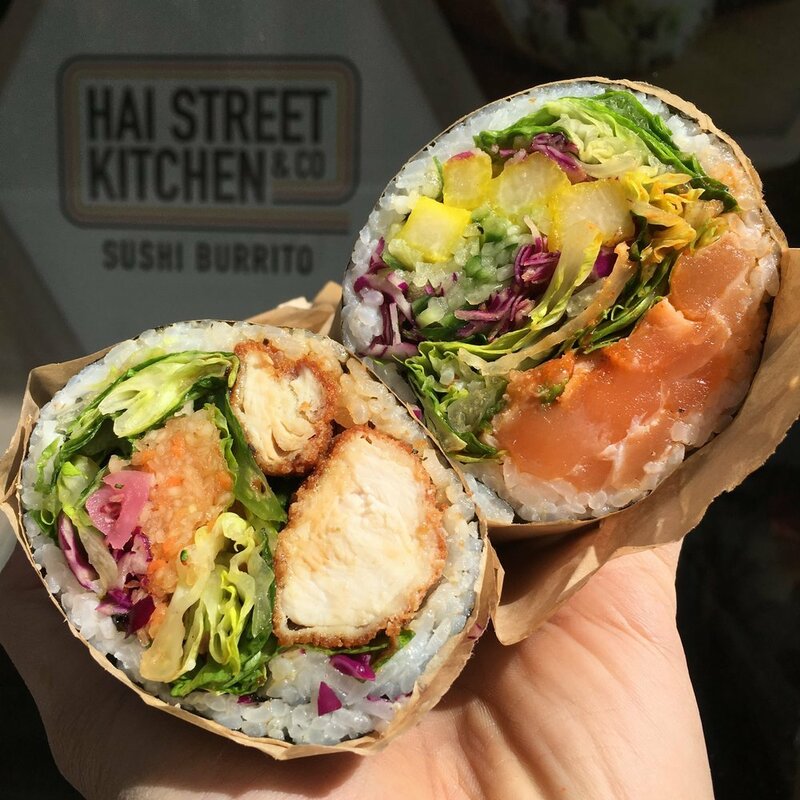 Rolling up eight variations of wraps right in front of you, the Flatiron shop has everything from the classic yellowtail-and-wasabi Satori burrito to non-fish options like the Caballero, made with sake-asada beef and Kimichurri sauce. And even though you don’t think vegetarian when you think sushi or burritos, they have one here: the spicy Japanese eggplant Buddha Belly. This Philadelphia-based eatery just opened its first New York brick-and-mortar in Midtown’s bustling indoor food hall Urbanspace Vanderbilt. 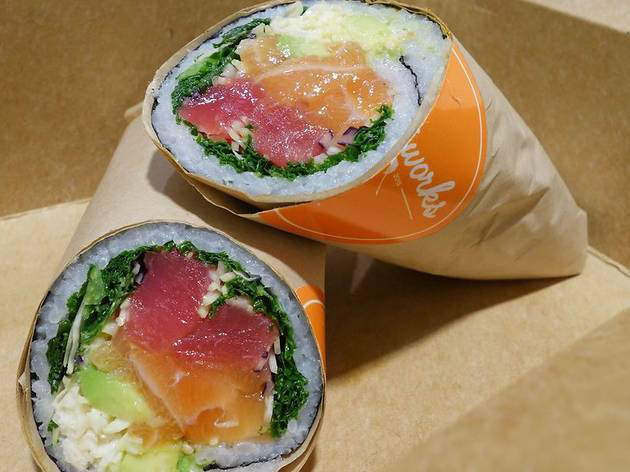 Here, sushi-loving hall-goers can choose from a range of signature rolls like the Flamin’ Tuna (yellowfin tuna tartare, gochujang sauce, romaine, carrot, beets, avocado salsa, tempura crunch) or the Slammin’ Salmon (tataki salmon, gochujang sauce, romaine, cucumber, pickled jicama, red cabbage). 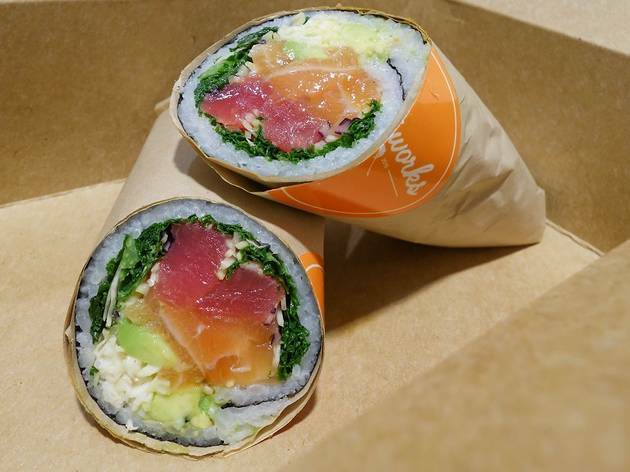 Just steps from Grand Central Station, the Rawl is rolling out sushi burritos for big appetites. Take the Ebisu—tightly wrapped in an ever-expanding toasted nori sheet ready to burst at the seams, this jaw-testing sushi bomb is packed to the gills with jalapeño-garlic marinated tuna, romaine lettuce, shredded carrot, cucumber, green cabbage, avocado and pickled ginger, accented by a sprinkling of electric-orange umami-rich masago. 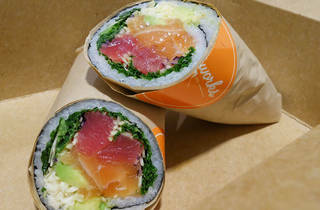 Photograph: Courtesy Yelp/ Kevin H.
Using only high-quality, sustainably sourced fish, Pokéworks puts a Hawaiian spin on this sushi trend, tossing the cubes of raw fish with chopped green onion, shredded sweet onion and a touch of Hawaiian salt before rolling it up with uniquely Japanese flavors like hijiki seaweed and shiso leaves. 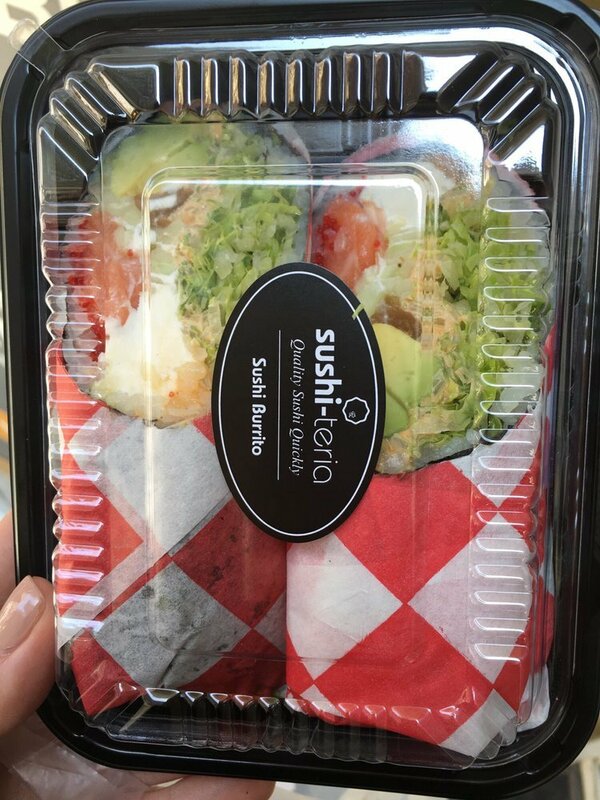 Outfitted with more than 10 mounted iPad menus on which ravenous lunch-hounds can browse, order and pay for their white or brown rice-lined burritos with lightening fast speed, Sushi-teria stays true to its slogan: quality sushi quickly. 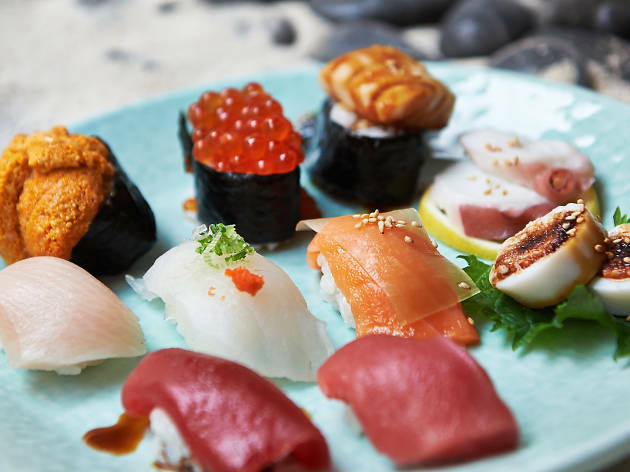 As for the sushi itself, try the Hawaiian Crunch, a multi-textural experience of finely-minced spicy tuna, seaweed salad, avocado, crunchy tempura flakes, sweet mango, crisp lettuce and masago. 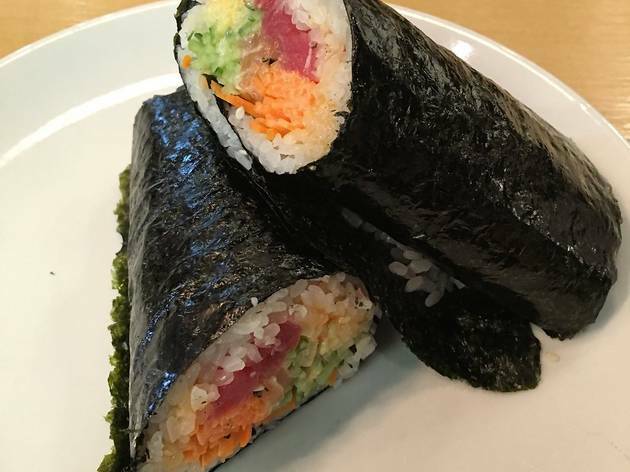 Serving up rolled originals like the Sea Dragon Burrito (eel, shrimp tempura, kani, tamago, avocado, cucumber, eel sauce), JP Street is an island of authenticity in an ocean of chain eateries. Wrapped with toasted nori and your choice of white or purple rice, these umami-rich bounties are available in both vegetarian and pescatarian form. 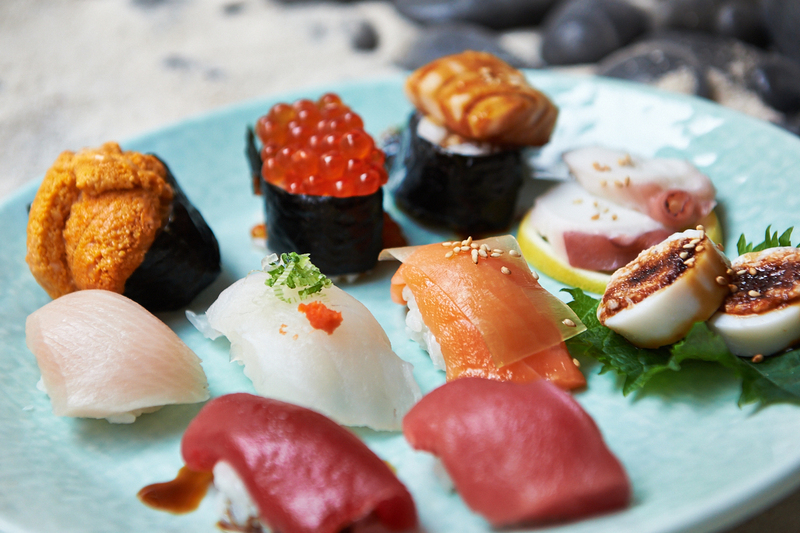 Looking for more great sushi?